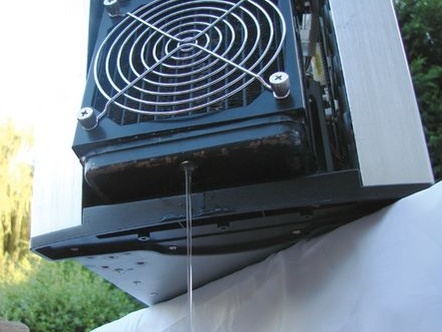 It was a hot summer six years ago that resulted in me doing the crazy thing of mixing water with some expensive electronic components in my PC. I’d overclocked my AMD Athlon CPU and it had a massive effect on my system, boosting frame rates considerably. Unfortunately, the hefty vcore meant my system started overheating in the 30 degree+ temperatures of my room and I had to downclock. Clearly that sucked, so I looked into more exotic forms of cooling and two months later I had water-cooled my PC and I had my CPU overclocked even further. Parts were pretty scarce back then but these days there are shops popping up all the time. Which brings me on to two exciting bits of news for those of us in the UK. 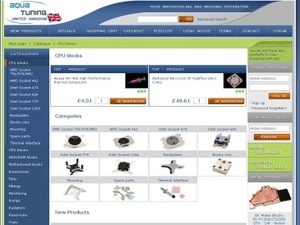 Where Aqua-tuning differs from many other UK stores is in the fact it offers a vast array of kit from German manufacturers, such as Watercool, Mips-computer and Alphacool, much of which has been unavailable or expensive to ship to the UK until now. I spent my whole lunch hour last Friday just browsing the huge selection of CPU blocks. Aqua-tuning also have a free postage offer on at the moment for all UK customers who spend of £50, which is always a good incentive to buy those super-heavy water-cooling component. There's more info on all that in this thread, should you want it. Free postage aside, it’s an impressive site and a great addition to the UK scene. Be sure to check it out if you’re considering a cooling upgrade. The second bit of news regards UK water-cooling radiator manufacturer, Thermochill. Previously owned by the folks at over-clock.co.uk, Thermochill radiators have widely been regarded as the best money can buy, with the PA range making great partners for low and high rpm fans. While they were also reasonably priced, they suffered from short supply and the fact that they used different fittings and had different fan spacing to most other radiators. This meant that accessories like fan grills aren't as widely available as they are for other radiators. The bleed screw is useful for draining a radiator without removing it from the case or disconnecting it from the cooling loop. However, it can leak and adds to production costs. 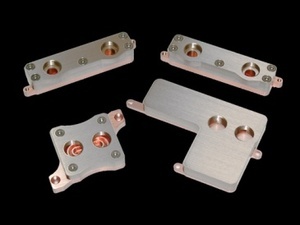 These things are set to change though because Manchester-based Watercoolinguk.co.uk has acquired the Thermochill brand and has pledged standardised fan spacing, getting rid of the bleed screw to reduce the chance of leaks and also to continue the development of the new 140mm range of Thermochill radiators. This is great news, especially for those of us in the UK because Thernochill radiators have traditionally offered very good value for money and aren't just shipped in from China. With a more common fan spacing, they should appeal more to modders too, as well as being able to fit in a large number of cases and the removal of the bleed screw (while I actually found it quite useful) can only help to lower production costs. The UK water-cooling scene is about to be shaken up significantly but one thing's for sure, the addition of Aqua-tuning and revitalisation of Thermochill mean there's never been more water-cooling hardware available to those of us in Blighty which can only be a good thing.